The international touring exhibition "Monet, Renoir and the Impressionist Landscape" will be on view in Richmond at the Virginia Museum of Fine Arts from Sept.21, 2000, through Dec.10, 2000. The exhibition, which is on view now in Japan and will later travel to Canada, will be shown exclusively on the U.S. East Coast at the Virginia Museum of Fine Arts and will then be exhibited at the Museum of Fine Arts, Houston. "The exhibition brings Virginians a dazzling array of superb Impressionist and Post-Impressionist works, while setting the context for the revolution in 19th century French landscape painting. We at the museum look forward to our visitors enjoying this gorgeous show in the museum 5 beautiful setting. says Katharine C. Lee, director of the Virginia Museum of Fine Arts. works," says Malcolm Cormack, Paul Mellon Curator at the Virginia Museum of Fine Arts. More than 60 paintings are shown in the exhibition, ranging in date from the 1830s to about 1900. The exhibition illuminates the development of landscape painting in France during the 19th century. It makes the point that there was a division between the Salon (France 5 official art exhibition) and the new, independent artists who became known as the Impressionists. 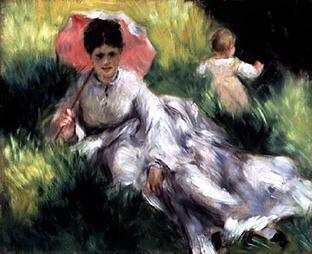 Approximately 40 Impressionist paintings form the core of the exhibition. 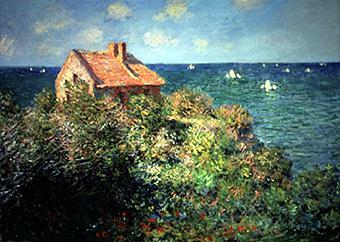 Eleven are by Claude Monet (1840-1926), who is regarded as one of the great geniuses of the movement. Another five are by Pierre-Auguste Renoir (1841-1919), whose concentration on beautiful scenes - pretty children, flowers, and above all, lovely women - have an instant appeal. Other Impressionists whose work is in the exhibition include Camille Pissarro, Edgar Degas and Alfred Sisley. date the Impressionists. The show also illustrates the legacy of Impressionism through a group of works by artists such as Paul Cezanne, Vincent Van Gogh, Paul Signac, and Paul Gauguin. who opposed classical conventions. (They took their name from a small village on the outskirts of the Forest of Fontainebleau.) Beginning in the late 1840s, the Barbizon painters developed an interest in landscape for its own sake, a new direction in French art, Cormack says. pictures were almost always done in the studio. Important works by the leaders of the Barbizon school - Jean Baptiste-Camille Corot, Narcisse-Virgile Diaz de la Pena and Theodore Rousseau - appear in the exhibition. "The Impressionists went a step further than the Barbizon painters by producing works completely painted out-of-doors based on direct observation of nature, brightening the colors in their palettes to capture the changing effect of light on their subjects," Cormack says. the first Impressionist show in 1874. The innovations of the Impressionists paved the way for later artists to experiment even more boldly with color and technique. In the exhibition's concluding section, landscapes by Post-Impressionist painters "poignantly demonstrate the lasting impact of the Impressionists' new vision," Cormack says. "Monet, Renoir and the Impressionist Landscape" was drawn from the collection of the Museum of Fine Arts, Boston, with additions for its Richmond showing from the Virginia Museum of Fine Arts' own collection. The exhibition is on view this year at the Nagoya/Boston Museum of Fine Arts in Nagoya, Japan (April 17-Sept. 26, 1999), and then travels to the National Gallery of Canada in Ottawa (June 1-Aug. 27, 2000). Following its Richmond showing, the exhibition will on view at the Museum of Fine Arts, Houston (Jan. 21-April 15, 2001). The exhibition was organized by the Museum of Fine Arts, Boston, in collaboration with the Nagoya/Boston Museum of Fine Arts on the occasion of its opening in April of this year. The exhibition is accompanied by a catalog written by George Shackelford, the Mrs. Russell W. Baker Curator of European Paintings at the Museum of Fine Arts, Boston.